Coordinate all metal work with graphic 45 staples to create uniformity of your metal work embellishments. The inspiration for this project was make an addition to the breakfast table setting used when we celebrate mothers day and my wife’s birthday. Two special days in our family. 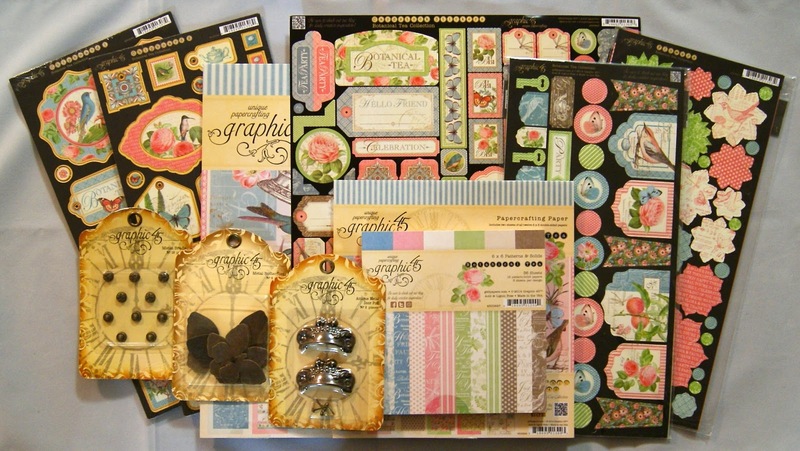 creations from the DT members and gain some inspiration and also check out the graphic 45 and scrapbook adhesives blogs. I might try altering it a bit so it can hold the Keurig pods. WOW, that is amazing, I love the inside of it!!! very awesome. 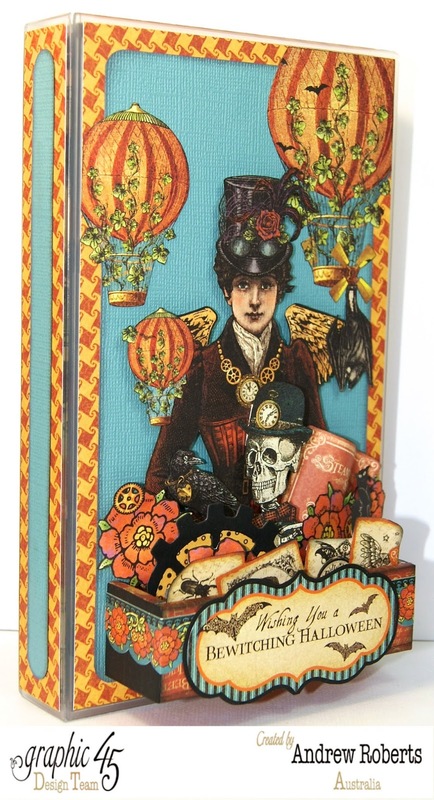 very pretty, love the botanical tea papers! This is stunning. I'm sure your wife loves to put this out on special occasions. The Botanical Tea collection is perfect for this. Great job! Beautiful work - the detail is wonderful! Wishing you a happy day! This is just a gorgeous project Andrew! Love it! How Cute is that, very nice job! What a beautiful Tea Caddy! Love the Botanical Tea collection and you certainly did it justice! TFS! I might have to start drinking tea! Reminds me of my sweet Sister. Love it! Andrew, you know I love your tea caddy. (since I already had a sneaky peek at it). You really rocked it with this special project. How B E A U T I F U L ! ! ! Love LOVE L O V E it!!!! Wow! Such an interesting box! joy remain in Constant Readers! Andrew your tea caddy is beautiful! Wow. So beautiful. I wish I could make something like that. Have you thought of making a tutorial for this. I would love that. 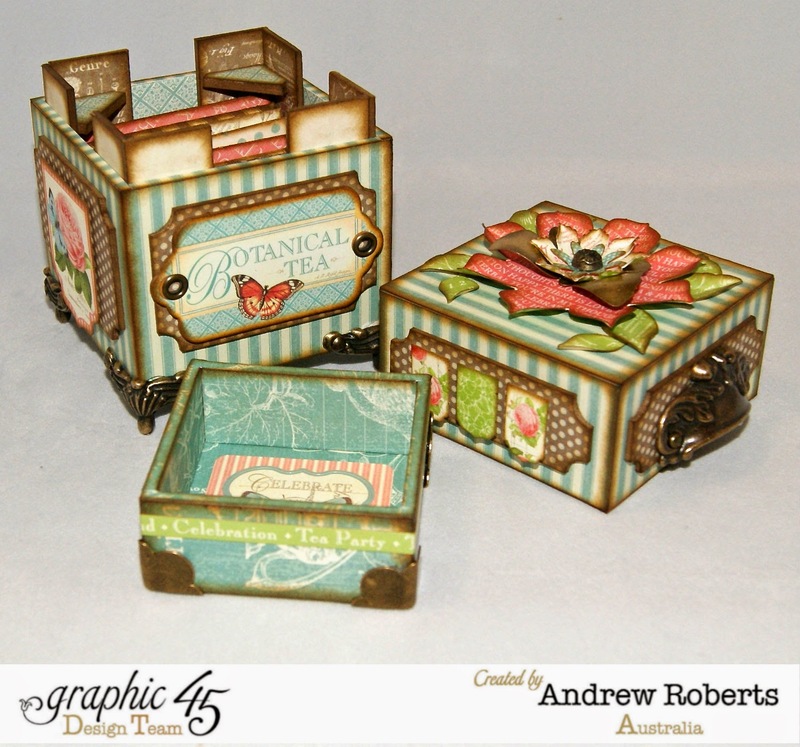 The tea caddy is gorgeous and you used my favorite Graphic 45 collection! How sweet of you to make such a beautiful caddy for your wife! Beautiful and very clever idea. 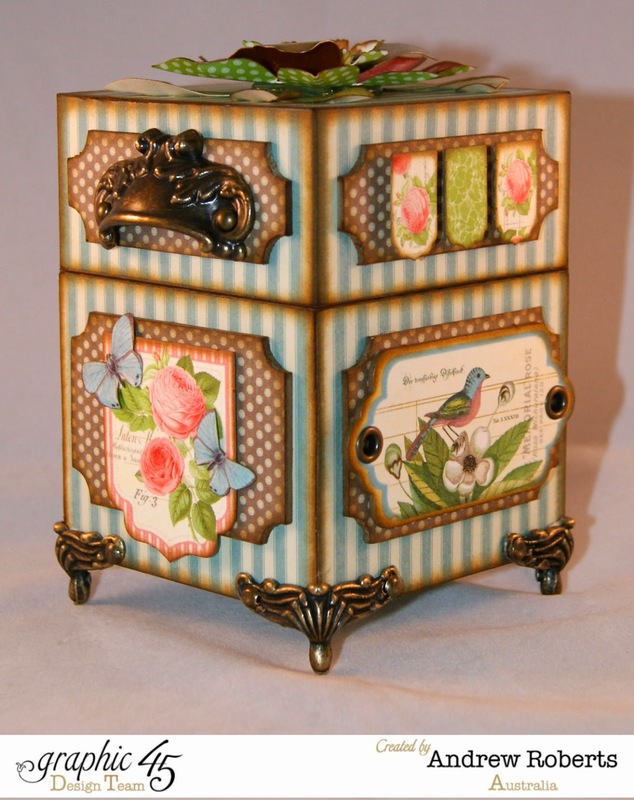 Beautiful tea caddy! Would love to make one for my mom. 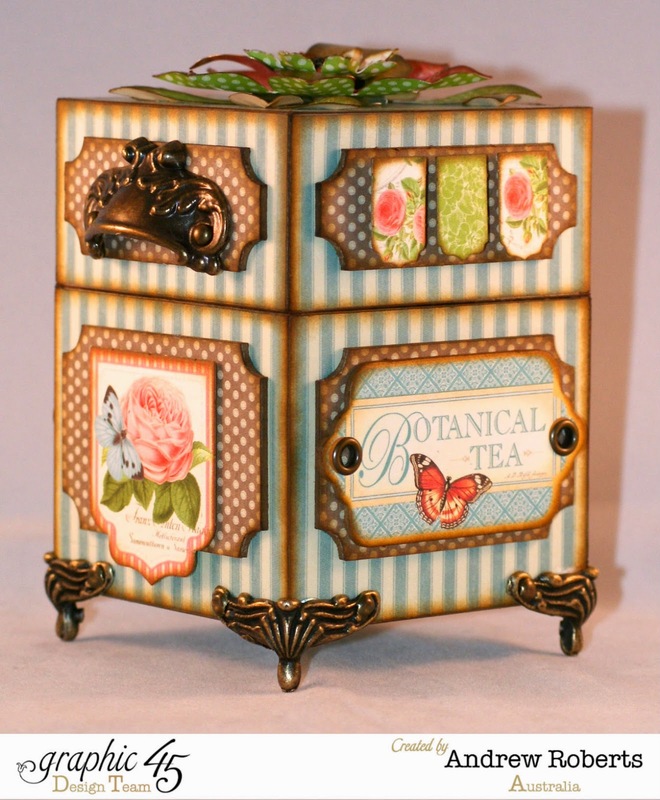 This tea caddy is beautiful! Would love one for myself. What a fabulous project. This tea caddy would make such an impressive gift. Well done. I pinned it. Love your gorgeous creations - You should have tutorials, perhaps on Etsy, to recreate these masterpieces. Stunning! What a beautiful gift this would be for a tea connoisseur! Oh my gosh, this is a fabulous project. Love that beautiful tea caddy. So cool and great tips on creating something so fun. Awesome project! The blog hop is fun! 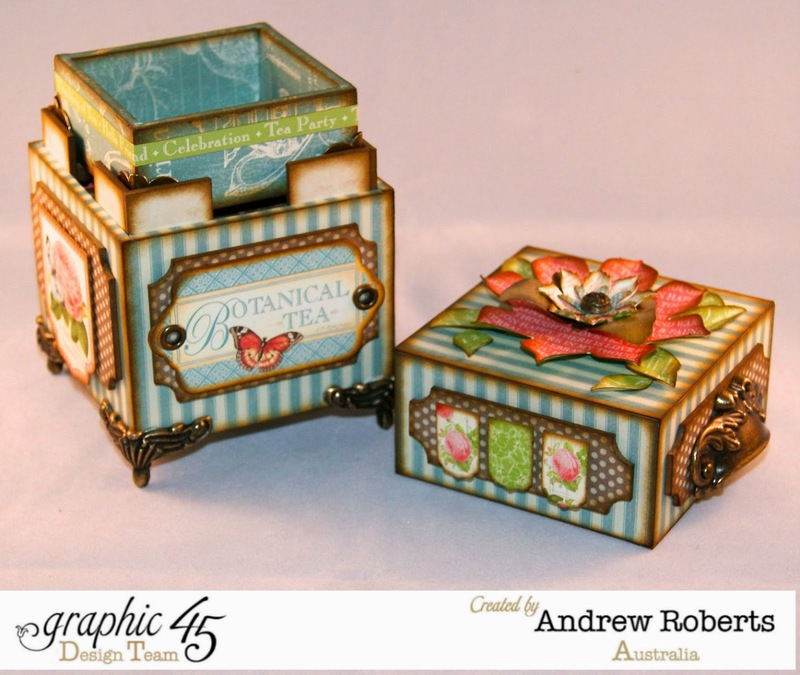 I really enjoy your projects for Graphic 45, and this tea caddie is a great example. Seven children? Wow, I hope they have learned a lot from you. What a fun Mother's Day it must have been. This is a lovely tea caddy Andrew, your wife must feel treasured!!!! Well done!!! You did a wonderful job!! Thanks for sharing. Wow!! Your project is just fabulous!! LOVE it!! Thanks for sharing!! What a beautiful project! You really are such an inspiration, love your work!!! Wish I had a husband who did things like that for me. Unfortunately my Ex-husband only thought about himself. By the way hi from Melbourne, it's also not that common for males to be into craft, so congrats on your stunning projects, I love them. Love the papers too. Wow your work is amazing, love the tea box. Such beautiful creations! Thank you! Your tea caddy is absolutely gorgeous. Thank you for the inspiration. Delightful! Thank you for the gorgeous inspiration and great how-to! Oh my goodness! This is beyond gorgeous!! Would love to have this on my kitchen counter. Love it! Andrew...I had never seen your art before...It's beautiful!!! what a gorgeous tea box, it would make a beautiful gift!!! This box is BEYOND beautiful! I love it! What a lovely gift to have on the table for these special occasions!!! You are thoughtful as well as creative!! I am working on a box I found and just put the feet on it. Thank you so much for your inspiration. My box is for my son-inlaw and I am using a couple pages from 2 different ocean/beach themed G45 collections. 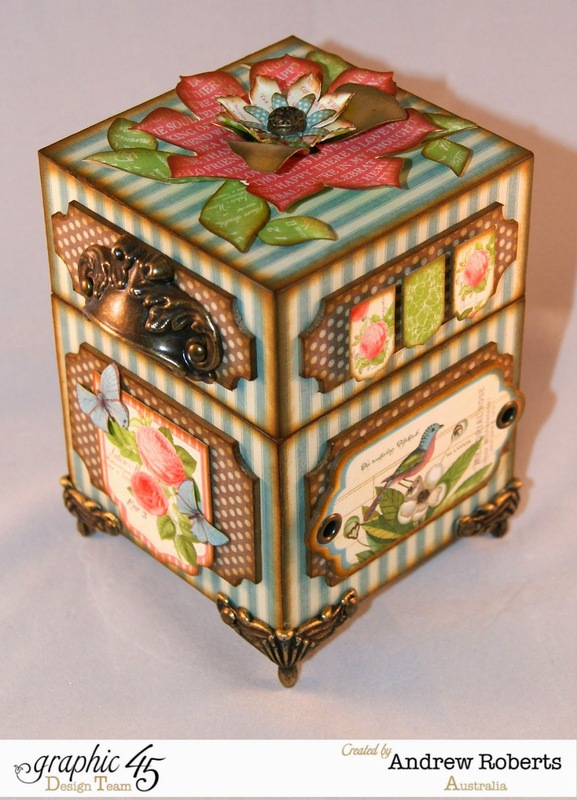 I really appreciate you sharing your fantastic work with us..
What a beautiful tea caddy. Gorgeous tea caddy so pleasing to look at. 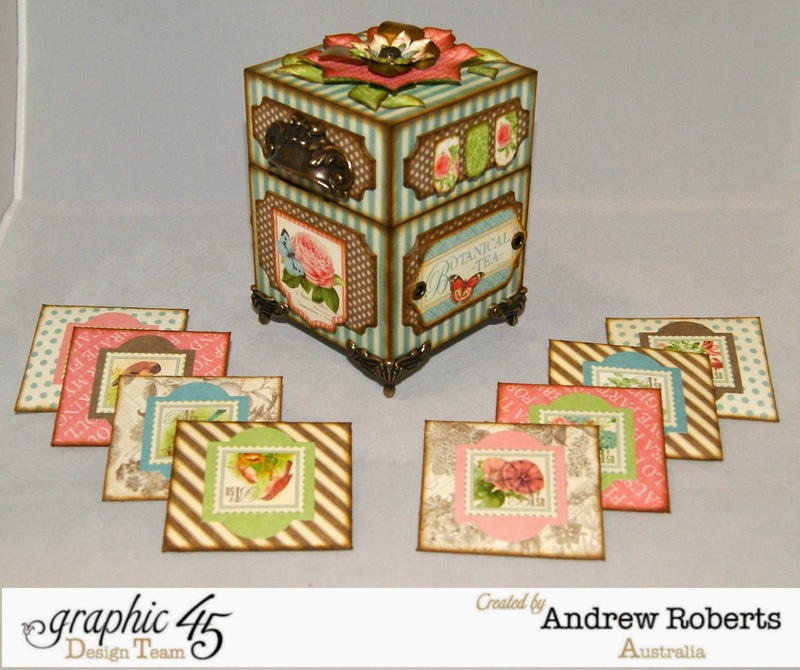 I LOVE your tea caddy, Andrew! Unreal! Definitely a work of art and something to treasure for years to come! Where can I get one?! Oh, I mean the box not the great husband, I already have one of those! This stunning tea box! Excellent! 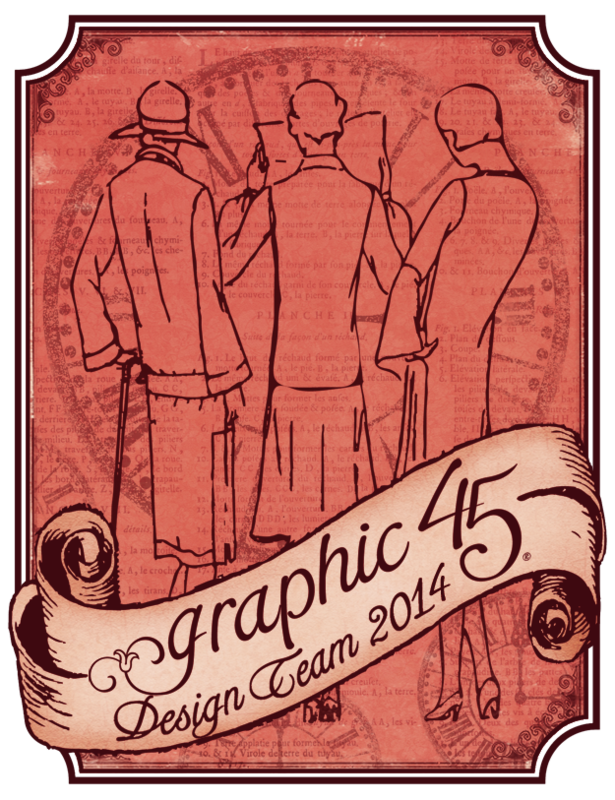 Your projects are amazing and no wonder G45 selected you for their Design Team this year. BRAVO! thanks for the detailed pictures of the tea caddy. It is beautiful. Your work is incredible. The vision you have and then to be able to put it all together. Thanks for sharing. Seriously! This is amazing, as always. I so need to come and get lessons on making 3D items! You are a master! Maybe you can come and teach here in So. CA. Fabulous little box. The fact that there are two ways of holding tea bags is great. So nice. Fabulous! Love your idea and excellent craftsmanship! Thank you for Lovely inspiration. Your Projects are Always so very well done. Thank you! 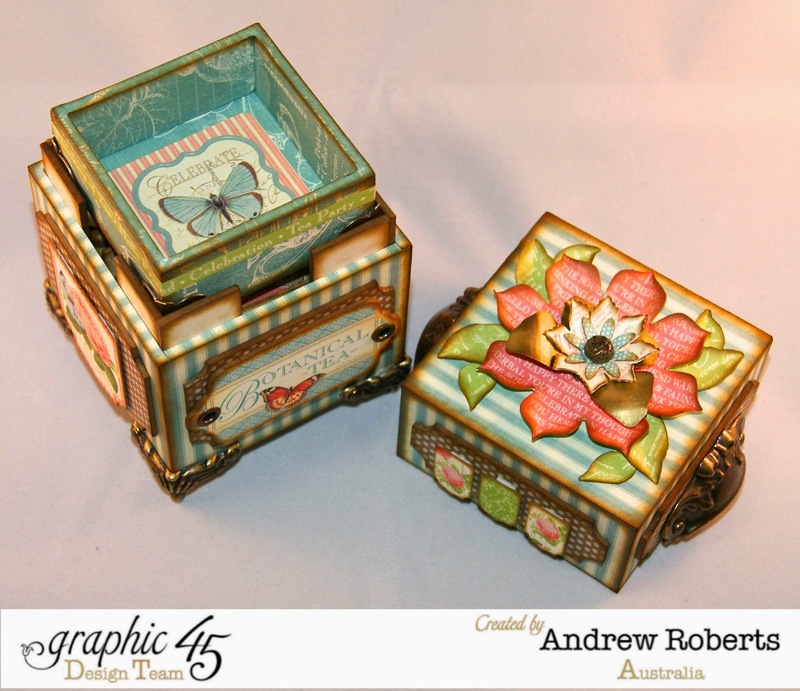 Andrew I love this idea... the Tea Caddy is awesome ... those prints are so very pretty love the feet !! Love your work and this tea caddy is gorgeous! What a great use of Botanical Tea! As always, it's clear to see why GR 45 has you on their Design Team!!! 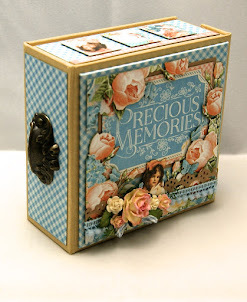 The tea caddy is really so romantically-pretty and vintage-looking!! love the tea caddy I would be afraid to use it on my table though in fear of it getting ruined. Thanks for sharing. This would be a perfect present to give to a few of my co-workers for Christmas. Such a lovely idea and small as it is, there is still loads of detail. Thanks for sharing. Beautiful project. I would love this for my tea. I adore your tea cabinet!!! Great idea for a gift, hmmmmmmm. Super! Thanks for the inspiration! Can't wait to try to make one like this! It is awesome!!! Thanks for sharing!!! Love your beautiful Tea Caddy! Love all the little details on this tea caddy. The tea caddy is so cute - love the inside detail with two layers. Andrew, your Tea Caddy is awesome. Can see why you are part of the G45 team. Love the tea caddy. Want to replicate. 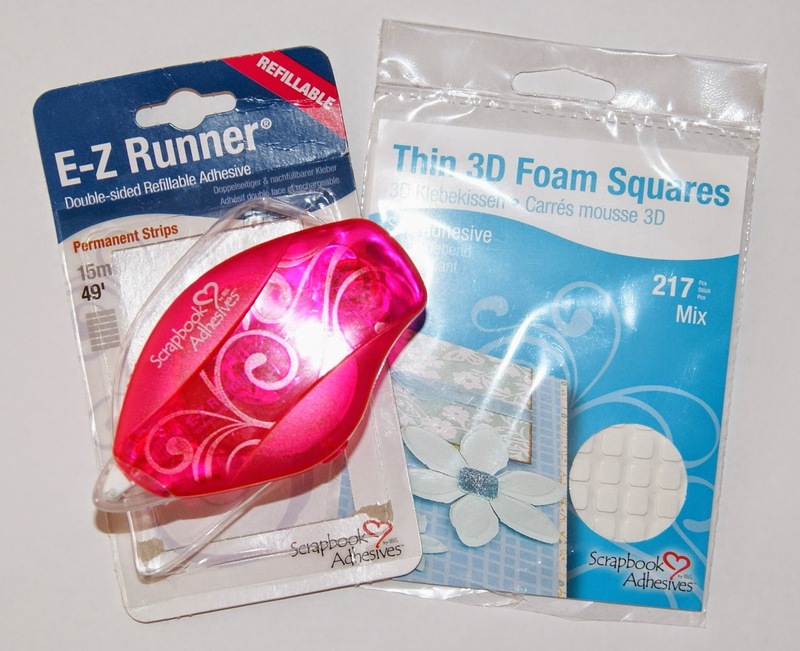 Cool your Adhesives work is amazing!